It doesn't matter if you have a 10 window storefront or 5 story condominium complex, a one-time cleaning for a single restaurant or a monthly window washing service for 100 retail locations, ABI Window Cleaning understands the requirements for each type of commercial account and will tailor our service to meet your specific needs. You will always have the peace of mind that a trained, equipped, bonded, fully insured, courteous professional is caring for the appearance of your location. 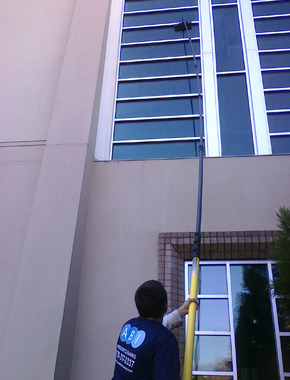 Pricing for commercial window cleaning can sometimes be handled over the phone but a site visit is recommended. As with any other service that we offer, we stand by our work and have a 100% satisfaction guarantee. Contact an ABI representative today for more information.